The hugely popular elevated public park, built on a former freight line, has presented a unique challenge and a significant opportunity for Weston Walker, design principal at architecture and urbanism practice Studio Gang: he’s designing a building, 40 Tenth Avenue, that overlooks it. The building, scheduled to open in 2019, is located at 10th Avenue, with 14th Street to the north, 13th Street to the south, and the High Line directly to the east. Studio Gang conceived a design for 40 Tenth Avenue that would minimize the blocking of sunlight along the High Line. To do so, Studio Gang decided to build as close as possible to 10th Avenue, which required variances from the city to work around the zoning laws. Because the development site is at the edge of Manhattan, with only a three-story building and two streets separating it from the Hudson River, 10th Avenue would have access to light regardless of the building’s position. “[We didn’t] just follow the zoning regulations but rather tried to distill the intent of the zoning—which is to protect light and air and the quality of the city’s shared spaces—and to propose a solution that is in that spirit,” Walker says. 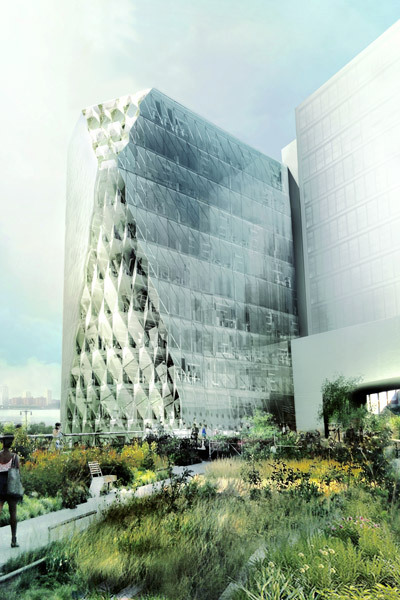 Even set away from the High Line, a conventional tower would block the park’s access to light, so Walker and his team cut into the building’s mass using a technique they called solar carving. 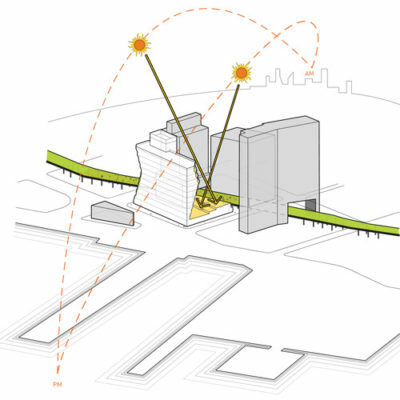 They analyzed the sun’s path and identified the building shape that would allow the most solar access to the High Line. Then, they presented their plan to New York City’s Board of Standards and Appeals and were granted the necessary variances. The High Line isn’t the only thread that runs through the project’s particular city block. The development also sits on the edge of Manhattan’s original shoreline, which means that half the site is original soil and half is fill. The shoreline presents additional challenges, but primarily its poor soil conditions, common throughout Manhattan, lead to water leaking into the foundation. In addition to managing subpar soil conditions, Walker’s team had to avoid impeding on the foundations of surrounding structures, including the High Line. They partnered with Friends of the High Line and the New York City Parks Department to ensure that construction would not damage the park and that maintenance crews would have complete and continuous access. The building’s design elements nod to both the neighborhood’s history and its future. The entry level includes metal detailing around the canopies, doorframes, and loading areas, harkening back to the Meatpacking District’s industrial past. Higher up, Walker and his team accentuated the building’s atypical shape with high-performance, three-dimensional faceted glass. “In the carved areas where the façade is not vertical, we have a different kind of curtain-wall shape made out of angled pieces of glass that gives a finer texture and play of light to the carved areas, basically turning the concept of the building into its design feature,” Walker says.